Begin with 'Craft': VHS Conversion Success! In my last post, I wrote about becoming inspired over Thanksgiving to convert our family's old VHS home movies to digital format. I had ordered some software and was waiting for it to arrive. Well, it did arrive and I did convert one of those VHS tapes! 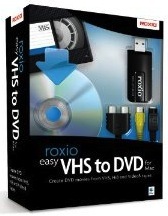 I had ordered a software and cable combo from Roxio called Easy VHS to DVD for Mac. I'd done some research and read numerous reviews before making this purchase. There are a number of options out there, and this is one of the best reviewed for Mac. And as the title suggests, it was relatively easy to use. I installed the software in seconds, but ran into a little trouble when connecting the cables. I plugged the cables that came with the software into the audio cables that I normally use to connect my DVD player to my TV. I then connected one end of the cables to my computer and the other end to my VHS/TV combo. Nothing happened. I then went to use my parents stand alone VHS/DVD player and plugged the audio cables into the front plugs. Nothing happened. My mom then suggested unplugging the VHS/DVD player from the TV and plugging my cables into the connections in the back. Success! Once the cables were hooked up correctly, I was able to see and hear the VHS tape on my laptop as it played in the VCR. All I had to do was hit "record" in the software and "stop" when the tape was over. Easy! The software then saved a copy and sent another copy directly to iMovie. The quality of the resulting digital copy is good, but not great. The images are sometimes jumpy during fast movement, but I'm pretty happy with the results, especially considering how easy it was to create. This home movie focuses on me, my sister and two cousins playing on a swing set, a sand box, with some pets and then ultimately catching lightning bugs. There's a lot of random stuff in here and a lot of unintelligible 6 and 4 year old chatter. I decided to save an original raw copy and then created an edited version with "the good stuff." I then uploaded a medium quality copy to YouTube and will be making copies on DVD for the family.